The Starfish folder includes academic information from LionPATH, as well as record of meetings, notes, and tracking items. 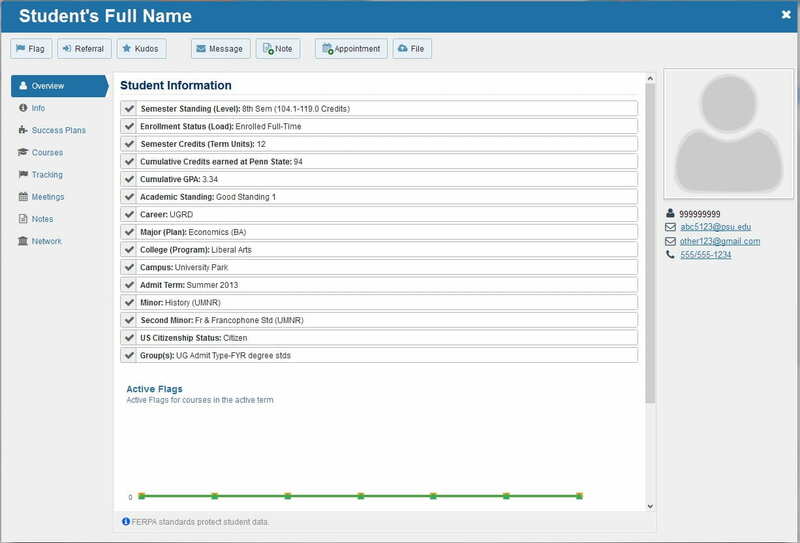 The Overview tab of the student folder shows academic information imported from LionPATH, as well as a graph of active warning flags for current courses. The displayed Student Information is a snapshot of LionPATH information taken at 6:00 pm EST the prior day. LionPATH should always be considered the authoritative source for a student’s academic record, but this snapshot can make it easier for advisers to quickly review important academic information. NOTE: All items on this tab are filterable, meaning you can use these categories and values to find other students with the same criteria. In this example folder, the adviser can quickly see this student is an 8th semester Economics BA major, with minors in History and French & Francophone Studies, currently enrolled full time and in good academic standing. The student was admitted to Penn State in Summer 2013 as a First-Year student. NOTE: If there is no value for a particular piece of information, it is not displayed. For example, the student above does not have a second major, so no entry for Second Major (Plan) is displayed. Second Career – The student’s concurrent career, if applicable. This will be most commonly seen for students in integrated undergraduate/graduate programs. Second Admit Term – The semester when a student was admitted to a concurrent career. Group(s) – All groups the students is part of, according to the Academic Background screen in LionPATH. The information tab displays admissions, demographic, and enrollment information imported from LionPATH. In the Admissions section, the Math (Other) score is the student’s highest ALEKS score. To see courses the student is currently taking, choose Term = Active and Status = Active. To see courses the student late dropped, choose Term = Active and Status = Dropped. NOTE: Starfish currently only displays the first integer in the credit hours, e.g. “3” instead of “3.0” so 1.5 credit courses display here as 1. The issue has been reported and we are seeking resolution with Starfish support. View any past or present tracking items. To see items you raised, select Created By = Me. To see all items that were raised, select Created By = Anyone. Change the view using the View drop-down menu. For example, if you want to know if the student has any flags, you can choose the Flag Inbox. Change the Status to Active to see current flags, or Resolved or Both to see all flags. You can add notes to any tracking item by hovering over the icon and choosing “Comment” or “Clear.” A comment remains with the student’s folder. Choosing clear allows you to also send a message to the person who raised the tracking item. Additional details about responding to tracking items is in the Responding to Tracking Items section. The meetings tab shows the history of all meetings scheduled through Starfish. Clicking the “plus” symbol expands the meeting entry to show additional details, including the meeting notes. Any comment typed into a text box is stored as a Note in Starfish. Notes attached to Meetings and Tracking Items are also visible in the Meetings and Tracking tabs. You can filter these notes to see only the ones written by people in a particular relationship to the student or on a particular note type (e.g., Appointment Comment, Academic Review notes, etc.). Use this tab to view the student’s instructors and assigned advisers. NOTE: Starfish receives the most recently assigned adviser from LionPATH. If the student has recently changed enrollment unit, but the new unit has not yet assigned a new adviser, the previous adviser remains visible and connected to the student.